If you know me at all, you know I absolutely love food. I know it’s all the rage to be a foodie now that the Food Network has made watching cupcakes for an hour a real thing, but I promise you I’ve been cooking myself things since elementary school. (Bacon for an after-school snack anyone? No wonder I was such a chubster.) I had a hard time deciding whether or not to post this because it’s not really portrait or event photography, but hey, it’s my blog so I’ll do what I want. This was posted in a Chow.com video, and, while I could’ve done without the smug delivery, it made me rush out to buy high-grade cocoa powder and a four-pack of butter. I love a fudgy, rich brownie and this really hit the spot. This is taken directly from Kir Jensen’s book The Sugar Cube: 50 Deliciously Twisted Treats from the Sweetest Little Food Cart on the Planet. You should make this. Heat the oven to 350°F and arrange a rack in the middle. Place 18 paper cupcake liners into 2 (12-well) muffin pans (you will have empty wells). Whisk together the flour, cocoa powder, and salt in a medium bowl. Set aside. Place the butter in the bowl of a stand mixer fitted with a paddle attachment and beat on medium-high speed until fluffy, about 3 minutes. Using a rubber spatula, scrape down the sides of the bowl and the paddle. Return the mixer to medium-high speed, add the sugars, and mix until light in color and fluffy, about 2 minutes. Scrape down the sides of the bowl and the paddle. Return to medium-high speed, add the crème fraîche and vanilla, then add the eggs 1 at a time and mix until evenly combined. Scrape down the sides of the bowl and the paddle. Turn the mixer to low speed, add the flour-cocoa mixture, and mix until just combined. Remove the bowl from the mixer and stir the batter a few times to incorporate any remaining streaks of flour. Divide the batter evenly among the lined wells (they will be almost full). Bake the pans side by side, rotating them from back to front once during baking, until the edges of the brownies are puffed and set and the centers look slightly undercooked (but not raw), about 20 to 25 minutes. 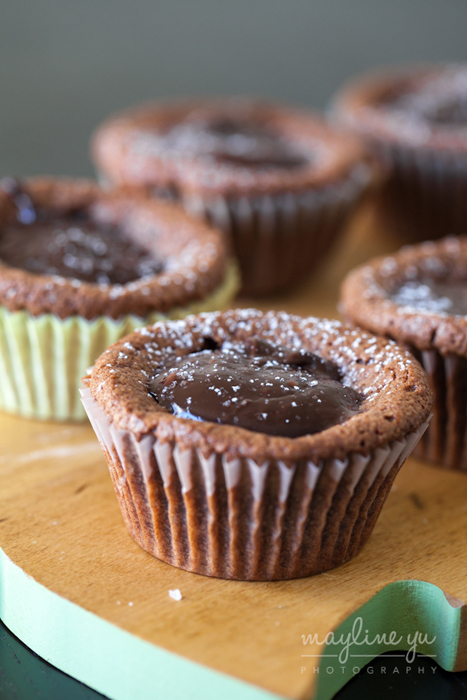 Set the muffin pans on a wire rack and let them cool for at least 10 minutes, then remove the brownies from the pans to finish cooling on the rack. Once the brownies are cool, divide the ganache among them, placing it in the indentations of the brownies. Just before serving, drizzle each brownie with olive oil and sprinkle it with a pinch of the flaky sea salt. Tagged Baking, brownie, Chocolate, Dessert, Kir Jensen.